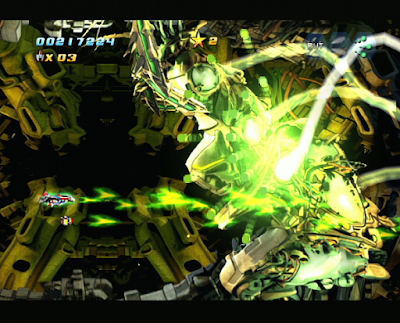 Sturmwind started life as an Atari Jaguar CD title called Native, but development was eventually switched to the Dreamcast due to the Sega system's more advanced technical abilities. You can find playable demos and videos of Native by doing a quick Google search, and there are a couple of Easter eggs included in Sturmwind that give a nod to the Jaguar-based origins of the game. 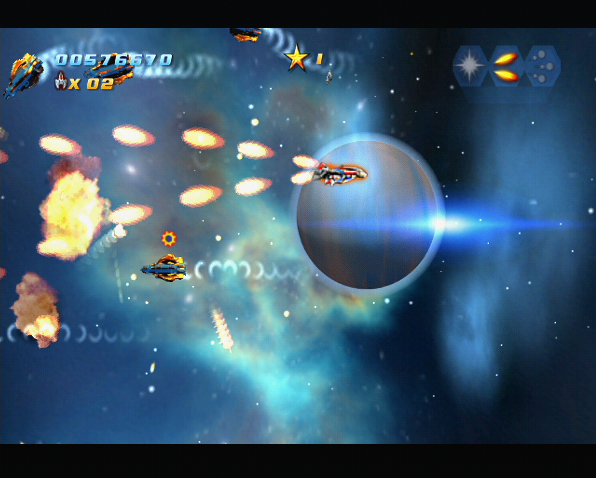 First and foremost, Sturmwind is a side-scrolling shoot 'em up (or shmup) that gives the player control of a ship equipped with a weapons system that also doubles up as a life bar. There are three main methods of dealing out death - Lichtblitz, Nordwest and Rudel. Each have their own strengths and weaknesses, with Lichtblitz offering increased defensive coverage via an arc of ship-protecting fire; Nordwest offering 360 protection with liberal dabbing of the fire button; and Rudel offering conventional forward-firing green lasers with more strength than either of the other two. The main mechanic in Sturmwind is that each weapon system represents the player's energy bar (in a way), and being hit by enemy projectiles while operating one of them means you lose the abily to use it. Loose all three and your ship is toast. Happily, you can collect power ups that restore downed weapons systems, and if you happen to be using a particular system when you collect a correspondingly coloured power up, you add additional strength to that system. It's a rather ingenious and original way of doing things, and it's but one of the reasons that Sturmwind stands out from the crowd. 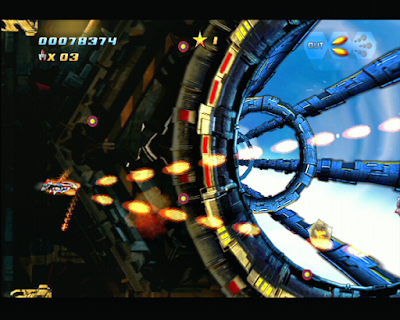 Level design too is equally inspired, with horizontally scrolling stages regularly mixing things up by adding in vertically scrolling sections - many of which have you dodging all manner of hazards or manoeuvring into tight spaces or gaps left by machinery in order to navigate the upward or downward motion of the screen. Art style is almost a mixture of Giger-esque visuals and Lovecraftian horror themes, with hulking great space installations drifting by in the background, and monstrous creatures lurking in deep water chasms, waiting to eat laser death. 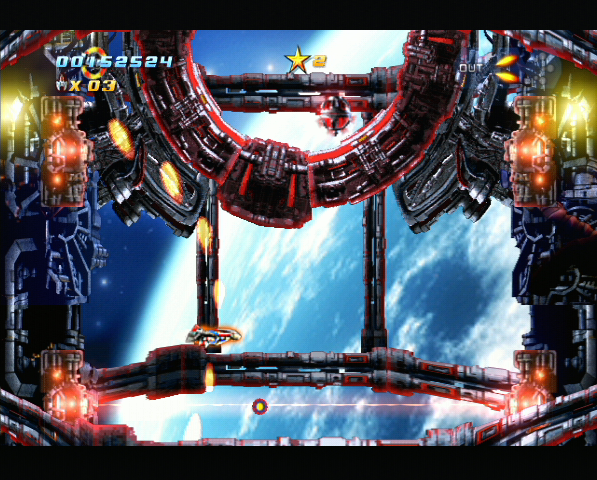 Due to this, there are the obligatory screen-filling bosses which await the player at the end of (and sometimes mid-way through) levels. 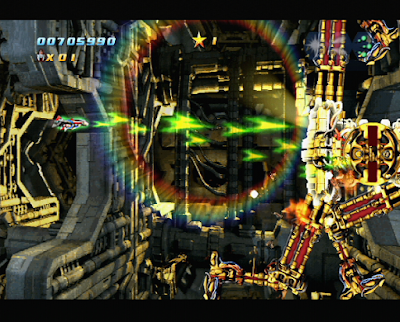 For the most part bosses are fairly predictable and their bullet patterns are fairly basic, although it must be said that Sturmwind is one hard game. Not unfairly so like some shmups, but it definitely takes some getting used to the backwards and forwards toggle for firing weapons, and you'll be seeing the 'game over' screen quite a bit before you conquer the entire single player campaign. The main thing that really sets Sturmwind apart from not only the majority of indie titles on the Dreamcast, but also the official library, is that it offers extras and features that you'd expect to see in a contemporary title. Achievements, unlockable content and online leaderboards are all included. You can even record replays of your gameplay if you have an SD card plugged in. 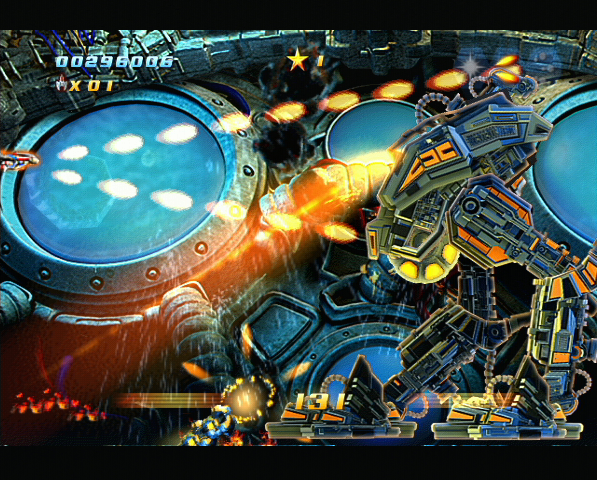 The presentation too smacks of a game that wouldn't look out of place on the PS4 or Nintendo Switch, with slick menu screens and thumping music matched only by the gorgeous in-game visuals, highly detailed player and enemy ships, and stunning pre-rendered backgrounds. The main appeal of a game like Sturmwind is that it really shows what the Dreamcast can do, even in the hands of a talented independent developer. 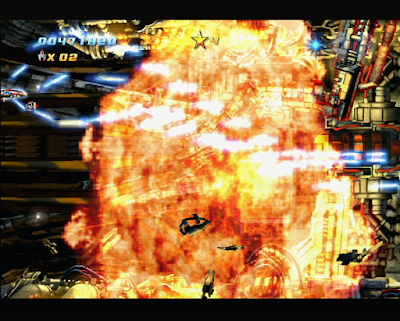 There are visual effects on display in Sturmwind that I personally haven't seen in any other Dreamcast title. 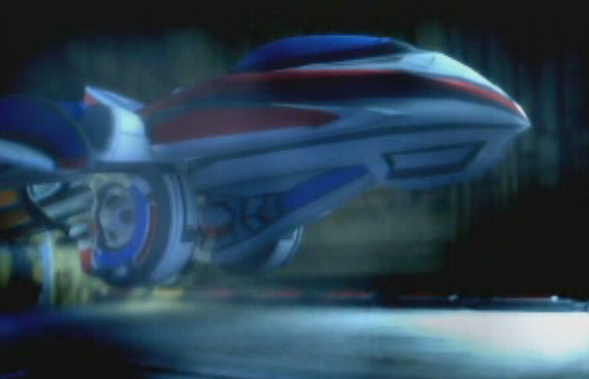 The blend of motion video backgrounds with foreground sprites is seamless and offers some absolutely stunning cinematics at times. Coupled with almost flawless gameplay and an inventive weapons/life system, and Sturmwind a surefire winner. On top of all this praise, there is the sheer amount of content and stuff to see and do. There is a stupid amount of hidden bonuses to unlock, and there are some really clever cameos and obscure references dotted throughout too. If Sturmwind had been released in 2000 by a major publisher it would most likely have been heralded as one of the Dreamcast's greatest games and given the worldwide recognition it deserves. As it is, even though it is revered in the Dreamcast community it is pretty obscure outside of our niche. 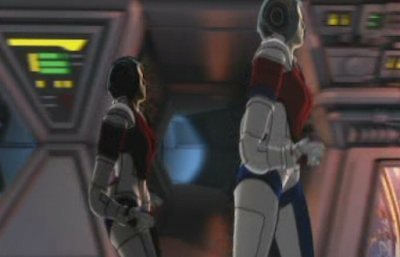 There are other titles on more contemporary systems that clearly take inspiration from Sturmwind (Soldner-X 2: Final Prototype instantly springs to mind), but for me nobody did or does it better than Sturmwind. Sturmwind is easily one of the best games - let alone shmups - there has ever been on Dreamcast. With the recent re-release almost nullifying the obscene eBay prices that Sturmwind was commanding up until a couple of years ago, you owe it to yourself to grab a copy and drop it in your GD-ROM drive. What do you think? Do you agree or do you dislike Sturmwind? Let us know in the comments or join the conversation in our Facebook group or on Twitter. Go get this people! One of the better moves by JoshProd in my opinion. I still have, and will never part, with my Windstärke 12 Limited Edition. The ship of which is in its own protected display case. "You can even record replays of your gameplay if you have an SD card plugged in." Or perhaps even via emulation? Listened to your Radio Sega broadcast and have been excited about this game since you played a track from this game! where I find that game?